There are a number of high performance paint curing lamps available on the market. Each lamp can be used to help auto body shops and others in the automotive industry to complete a wide range of repairs and improvements at an effective pace. But how do these products compare with each other and our own Infratech lamps? We explore the similarities and differences. Starting at the lowest end, we offer an affordable hand-held IT-500 curing lamp. This product is perfect for performing jobs on the move and is ideal for reaching difficult areas. The ultimate product for mobile drying, our lamp has a size of 42 x 35 x 10 cm, weighs just 3.5 kg and features long life bulbs of 8000 hours. In comparison, Sprayguns Direct also have their own hand-held product but at a more expensive price of £157. A similar product from Auto Body Toolmart’s is a bulkier lamp and described as portable rather than hand-held. At the mid-point of a curing lamp range is the 3kW version. The Infratech IT-3000 lamp is currently on offer for a limited time at £899.99 (plus VAT) and features fully adjustable drying head curing of 1000 x 900 plus comes with a temperature control and timer. The Sprayguns Direct alternative is nearly £100 more expensive and is shorter in overall size. 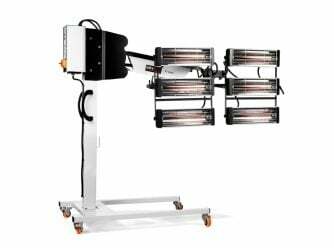 Auto Body Toolsmart don’t seem to offer a high-end 3kW lamp, while Victory Lighting’s basic version has a curing area of 800 x 1000. A 6kW lamp is the very best in high performance dry curing lamps and we are proud to offer one of the best with the IT-6000 product. This lamp is bigger and better in every way, allowing you to reach an incredible curing area, thus maximising your output and saving you time and money. Our lamp comes in a size of 1230 x 700 x 250 mm and features a curing area of 1.5 x 1 m which can be extended to 2m. If you need to cure a whole roof of a car or work in the commercial sector, rest assured that this lamp reaches heights of up to 2.6m. Our IT-6000 lamp is a worthwhile investment for serious auto enthusiasts and is almost £1000 cheaper than Sprayguns Direct’s version. At Infratech we offer high-end infrared paint curing lamps suitable for all kinds of automotive jobs. Visit our online shop to check out the full range of Infratech products, from a light handheld lamp to the powerful and versatile IT-6000. We are also available to reach on social media at Facebook and Twitter.